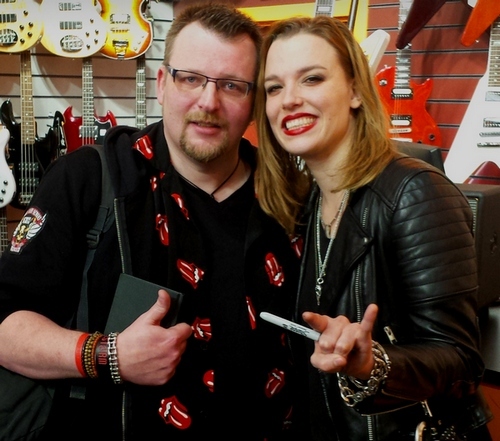 Before the gig, frontwoman, banshee, and all round Rock Star (with capitals) Lzzy Hale had a signing at GuitarGuitar in the Merchant City. With a massive queue of fans present, Lzzy was nothing short of phenomenal. She took time to talk to everyone, not just a smile and a signature, but an actual conversation and a one on one photo. Very classy. Also, it thrills me to say, she is such a nice person. Very grateful for her fans, very appreciative of where she and the band are in their career, and genuinely interested in what people had to say. Some signings I’ve been to have had the feeling of obligation hanging over them; Lzzy made this one feel special, even if to her it was just another day, just another city. With that done, hotel checked into, food acquired and several courage building beverages consumed, The Barras was the destination for the VIP meet n’ greet. Two pieces of exclusive VIP merch were given out, a seriously nice embossed leather wristband and a patch (which the band happily signed for me later) and then the queue to meet the band. Military precision and planning went into the Meet n Greet; but the band were warm, friendly, and in Arejay’s case, insanely pleased to meet us all – know when you see a puppy for the first time and it jumps all over you? That’s Arejay! It’s no bad thing, his enthusiasm is infectious! I’m not ashamed to say that Lzzy recognising me from earlier and a hug from her may just have made my year, let alone day. A quick photo with the band, another Lzzy hug, an Arejay… high five? Fistbump? Chestbump? (Not sure he even knew) and a handshake from Joe and Josh (who seem to be the quietest men alive!) and I was off out into the world again. And the gig? Oh, the gig. The two support bands (Wilson were my favourite, but Nothing More came close) were pretty decent, and made the most of their time on stage – but Halestorm were headlining for a reason. An amazing, professional, tight set. Everyone on stage never stopped grinning from start to finish, every song was hammered out as if it was the last time they would play it, and the whole set flew by. We had the obligatory flag waving from Lzzy (indeed, she wore it for the entirety of I Like It Heavy) and Arejay’s drum solo thrown in as well. Highlights? The new songs fit straight into the set list – Apocalyptic is intense, has an insane groove, and is in your face – Amen is a monster live, that riff under the chorus is huge; same goes for Mayhem, a song that’s been doing the rounds since the tour last year and is now honed to perfection. Love Bites, Mz Hyde, It’s Not You and set closer Here’s To Us refused to be out-shined though. The set delivered everything you would want from a Halestorm show… hell, anything you could want from a rock show. 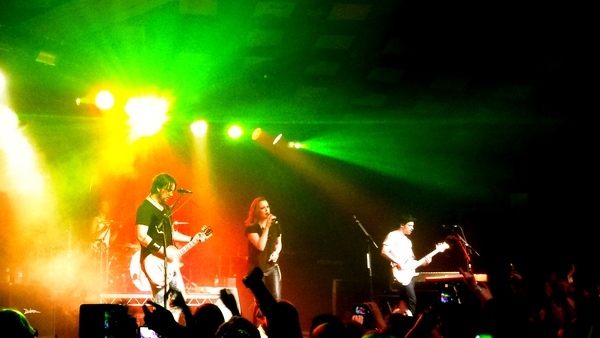 One of the greatest gigs the Barras will ever have witnessed. An absolute joy to behold, and I can’t wait for the next time round.